Thanks to Heritage Schoolhouse, we had a yummy breakfast this morning of Gingerbread Scones and piping hot coffee. Mmmm! Definitely the best way to start off a day!!! Combine flour, brown sugar, baking powder, ginger, baking soda, salt and cinnamon. Cut in butter until mixture resembles coarse crumbs; set aside. Combine the molasses, milk and egg yolk until smooth; stir into the flour mixture just until moistened. Turn the dough onto a floured surface; knead gently 6-8 times. Pat into an 8 inch circle; cut into 8 wedges and place 1 inch apart on a greased baking sheet. Beat egg white until frothy; brush over scones. Sprinkle with sugar. Bake at 400° for 12-15 minutes or until golden brown. Remove from pan to wire rack. Serve warm and enjoy! They look *yummy*. I bet your house smells delicious! 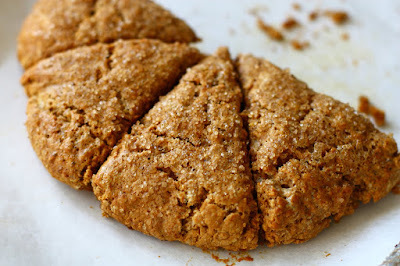 Gingerbread scones! sounds like a wonderful treat - especially when it's so cold outside, these sound warm and inviting. Thanks for sharing. Oh I love scones and gingerbread makes it sound even better! Yummy!!! I am going to have to make these. I am a big fan of scones and gingerbread...the best of both worlds. Thanks for sharing the recipe! Hmm, they look so good. I am planning on making some ginger bread soon, gotta find some molasses here in Croatia, next to impossible! We will love these scones! Hope you are having a fantastic week and thanks so much for sharing with us at Full Plate Thursday. We will look forward to seeing you again real soon! We have a NEW winner!!! Corn Chowder and a GIVEAWAY!!!!!! !